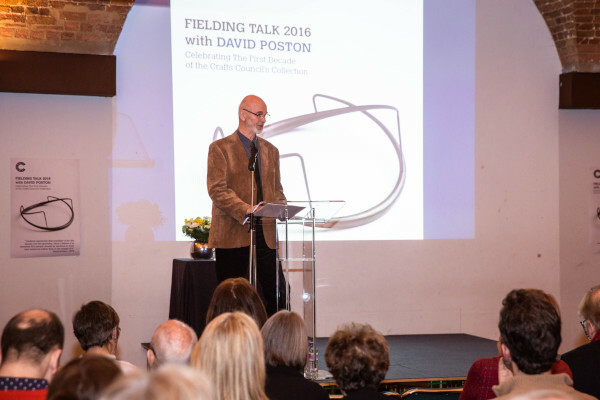 Digital sound file of David Poston's 2016 Fielding Talk, 00:36:16. On 23 February 2016, jeweller David Poston (b. 1948) was invited to present at Crafts Council’s annual Fielding Talk. 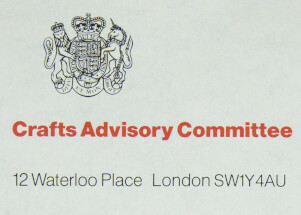 The event also marked the launch of the online catalogue – a key outcome of the HLF supported First Decade Project; a celebration of the first 10 years of the Crafts Council Collection (1972 – 1982). To mark this occasion, Poston shared some of the significant moments that shaped his career during this period of his jewellery practice and reflected on his relationship with the Crafts Council. Beginning with stories from his student years at Hornsey College of Art, through to his international development work, and return to craft practice; Poston shared how he explored his identity as a jeweller, quitting and returning to making on several occasions. He talks about his relationship with Ralph Turner, past Head of Exhibitions for Crafts Council and Electrum Gallery co-founder; curating the 1994 Crafts Council exhibition ‘What is Jewellery?’ and how he has come to coin his own definitions of jewellery, craft and design. David Poston speaking at the Crafts Council Fielding Talk, 23 February 2016. Photo: Iona Wolff.